Our lovely town house villa is a great choice for you to spend your holiday. Stunning, spacious, beautifully presented fully equipped town house villa in a small gated condominium with climate controlled warm / cold air conditioning and superior premium quality luxury furniture throughout offering a high level of comfort. Superbly located within a 10 minute / 800 metre walk to restaurants, quiet bars, cafes, snack bars, shops, supermarket, butchers and the gorgeous award winning Blue Flag Manta Rota beach with its endless soft sandy beaches. The beach has life guards on duty during the daytime from 1st June all through the busy summer months. If you don't fancy walking the 10 minutes / 800 metres to the beach there is ample free car parking facilities next to the beach. My lovely holiday home is situated within a private and electronically gated condominium built in 2008 of only 12 town houses each with their own allocated car parking space. The condominium has its own gated private swimming pool for you to enjoy. Baby's Cot and Highchair is already at our beautiful holiday home and available for use at no extra cost. Our fabulous luxury town house villa benefits from 3 spacious terraces as well as 3 good size bedrooms with baby's cot, comfortable living area, dining room, baby's highchair, separate well equipped kitchen, bathroom on the first floor and separate shower room on the ground floor. The living room has large two three-seater sumptuous leather sofas for your comfort and solid oak occasional tables, a LG 32' LCD TV with Portuguese & Spanish TV channels, Samsung DVD/CD player complete with a collection of DVD's, music CD's and reading books already there for your enjoyment during your holiday. The two main bedrooms have their own access to the Mid Floor Terrace affording easterly views. Bedroom 3 has its own access to the West facing top floor terrace with stunning views over the surrounding countryside of olive tress and also orange & lemon groves with a view of the ocean in the distance. At my lovely holiday home there is a private West facing Ground Floor Patio Terrace with a built in brick barbecue, with dining table and chairs affording dining for 6 people, perfect for al fresco dining during the warm Algarve evenings. And for the end of the day, there is a Roof Top Terrace with stunning views to watch the sunset with a glass or two of wine or a good book; this is the perfect recipe for a quiet and relaxing wonderful Algarve family holiday. The Luna Mar condominium swimming pool has sunbeds around the pool with outdoor lighting for the hours of darkness. A popular seaside resort, Manta Rota boasts the largest, longest and reputedly the best beach in the Algarve. This family orientated resort enjoys a gentle pace of life, its laid-back atmosphere makes it perfect for spending peaceful days in the sunshine. Mostly and quietly residential, Manta Rota offers charming restaurants, quiet bars, cafes, snack bars, shops, supermarket, butchers and of course, is also close to a variety of golf courses. Manta Rota in the eastern Algarve has one of the most stable climates in the world making it an ideal year-round beach holiday destination. The maximum recorded temperatures in the Algarve fluctuate between 25 °C in winter and 48 °C in summer. The winters are usually short and mild. Perfect! From our fabulous holiday home, one can take a 10 / 15 minute easy stroll to the uncrowded, seemingly endless sea front and amazing award winning Manta Rota Blue Flag beach situated in an unspoilt dune protected area. Whilst on the beach, you can take a leisurely stroll to Monte Gordo's beach (5 miles / 8 km) east and/or (when the tide is out) Cabanas de Tavira's beach (5 miles / 8 km) west. Not many people know this but the eastern Algarve is a well kept secret on the Algarve surfing scene, who are attracted by its quietness and warm sea temperatures. The eastern Algarve has the warmest sea temperatures in the Algarve, with the average local sea temperature being 17-20 °C. Between my holiday home and the fabulous award winning Manta Rota beach is a supermarket, butchers, shops, restaurants, cafes, snack bars and quiet bars. The supermarket is open 12 hours a day from 8.00am / 0800hrs until 8pm / 2000hrs every day and caters for most peoples everyday needs. with their picturesque marinas, extensive pedestrianized shopping and restaurant facilities, both towns are located on the Guadiana River which borders and separates Portugal with Spain. Neighbouring Villages include Vila Nova de Cacela which is the next town inland from Manta Rota situated about only 800m inland from your next holiday home. Vila Nova de Cacela has free pubilc access to computers at it's Internet cafe and the town has its own market on the 3rd Sunday of every month, get there early as it gets very busy! The next coastal village along from Manta Rota is Cacela Velha, an old fishing village situated in the protected Ria Formosa coastal landscape which is an important wetland where migratory birds can be observed in abundance and Cacela is one of the best preserved seaside villages in the whole of the Algarve. The pretty cobbled medieval village of Castro Marim on the banks of the Guadiana River is overlooked by two hilltop castles dating back to the 13th century. The buildings in the town are predominantly white, with flashes of ochre and luminous blue. The sandstone walls above Castro Marim enclose the first headquarters of the Military order of Christ, heirs to the Templars in Portugal. The Castro Marim golf course runs through undulating hills and calls for careful play with strategically places water hazards, fairway terrain and well places bunkers. If you are looking for culture, the elegant historic town of 'Algarvan Rome' Tavira (9 miles / 14kms) being authentically Portuguese, sits on two hills connected by a seven-arched 'Roman' (actually Moorish) bridge over the the River Gilao boasting many fine 18th century buildings along with its 37 churches. The eastern Algarve is also famous for its pottery and ceramics, particularly hand-painted pottery and azulejos or tiles. There are numerous ceramics and pottery outlets throughout the Algarve, including a shop in Manta Rota. Local markets in eastern Algarve include: Loule every Saturday; Moncarapacho 1st Sunday of the month; Castro Marim 2nd Saturday of the month; Estoi 2nd Sunday of the month; Tavira 3rd Saturday of the month; Vila Nova de Cacela 3rd Sunday of the month; Santa Catarina 4th Sunday of the month; Queles 4th & 5th Sundays of the month. Manta Rota a small village and quiet Algarve resort yet within easy reach of the bustle of Monte Gordo (5 miles / 8 km) with its casino and Vila Real de Santo Antonio (6 miles / 10 km) with its picturesque marina located on the Guadiana River. If you are looking for culture the elegant town of 'Algarvan Rome' Tavira, (9 miles / 14 km) sits on two hills connected by a seven-arched 'Roman' (actually Moorish) bridge over the River Gilao boasting many fine 18th century buildings along with its 37 churches. Cacela Velha, is an old fishing village situated in the protected Ria Formosa coastal landscape and is one of the best preserved seaside villages in the Algarve. Manta Rota boasts the largest, longest and reputedly the best beach in the Algarve. This family orientated resort enjoys a gentle pace of life, its laid-back atmosphere makes it perfect for spending peaceful days in the sunshine. Mostly and quietly residential, Manta Rota offers charming restaurants, quiet bars, cafes, shops, supermarket and butchers. Activities at Luna Mar Holiday Algarve include: Soaking up the sun; Relaxing by the pool or on the beach, or simply enjoying a glass of wine on one of our spacious terraces or simply having a BBQ. Costa Esuri, Spain (12 miles / 19 km) 18 holes, Par 72, 6607 metres, designed by Jose Canales, situated on the 'Spanish Algarve'. We look forward to having you stay for your next holiday in the Algarve. Finally, I hope your enjoy your holiday and, our lovely holiday home as much as we do! A little bit about myself, my holiday home and the locality... My name is Graham, born in north London but now living in Hertfordshire with my wife and family. I generally take a (well deserved if I may say so) break with my immediate family at my holiday home for a few weeks at least twice a year. However, one day I hope to retire to the Algarve in Portugal, whether it be full or part time; well, we all have dreams. Talking of dreams, I'm in the process of learning the Portuguese language but making extremely slow progress, thank goodness my tutor has the patience of a saint! I do hope that you enjoy reading about my holiday home and look forward to hearing from you soon. If you do have any questions, please contact me any time by email or telephone. I've visited alot of places in the Algarve, e.g. Lagos in the west, Albufeira, Vilamoura in central Algarve but when I visited the eastern Algarve I was sold. I love the rustic charm of the eastern Algarve, the pace being slower than the other parts of the Algarve, cars stop for you when you step onto the road, unheard of in other places, here pedestrian is king! When I first went to Manta Rota's delightful award winning Blue Flag beach, I said, 'this is where I want to be' and haven't regretted my decision. The beach is perfect for families being sandy and gently sloping to the, reputedly, warmest waters in the Algarve. Manta Rota is only about 40 km (35 / 40 minutes by car) from Faro and about 12 km (15 minutes by car) to the Spanish border; the best of both, very different worlds in my mind. My lovely holiday home is in a quiet location, overlooking olive trees, also lemon and orange groves with farmland and the sea beyond, yet within an easy 10 / 15 minute walk of the gorgeous award winning Blue Flag beach of Manta Rota. In between my holiday home and the lovely beach is a family butcher's, supermarket, coffee shops, restaurants, snack bars, (low-key) bars and shops just to browse around. And when I furnished my holiday home, luxury and quality were at the forefront of my mind. No expense was spared. All the wooden furniture is made from solid oak. The beds, mattresses and living room furniture is from a reputable English supplier, although the sumptuous leather sofas originate from Italy. I continually update my holiday home with popular music CDs, DVDs (mainly family films), reading (novels) books etc. I have had much praise from guests staying at my holiday home. Some of their reviews are listed within this advert, other guests have left their positive reviews in the 'comments book' at my holiday home. I look forward to hearing from you and thank you for taking the time to read about my lovely holiday home. toilet, Wash Hand Basin with cupboard under. Bathroom 1 is located on the First Floor being fully tiled and complimented with his 'n' hers (Jack & Jill) twin wash hand basins, WC, bidet and full size bath with shower facility & screen over; Shower Room / Bathroom 2 is located on the Ground Floor and is again fully tiled featuring a double size shower enclosure, WC and wash hand basin. On the top floor there is also a W.C. with a Wash Hand Basin and cupboard under leading off from Bedroom 3. Plus, there is also an enclosed Shower outside located on the West facing Ground Floor Patio / Terrace (26 square metres approx.) - suitable for us (those) who make a real mess of themselves when cooking on the BBQ !!! Two large three-seater Italian leather sofas. LG 32' / 81cm LCD TV with Portuguese & Spanish channels with separate Samsung DVD player. Solid oak occasional tables. Dining table & chairs for 6 adults and a Baby's Highchair. 6 square metres approximately situated on first floor with direct access from the second bedroom affording easterly views. Cot & Highchair already there & available for your (or rather your baby's (up to 2 years of age)) use at no extra cost. Living room has two large three-seater Italian leather sofas for your comfort with solid oak occasional tables; LG 32" LCD TV has Portuguese & Spanish TV channels; Samsung DVD/CD player complete with a collection of DVD's, music CD's & books already there for your enjoyment during your holiday; Rear West facing terrace with built-in barbecue / BBQ & outside dining table & chairs (with parasol & base) that will comfortably seat 6; Condominium communal swimming pool with sunbeds around; Outdoor lighting for the hours of darkness; Own allocated private car parking space within the condominium; All situated within an enclosed private & electronically gated condominium built in 2008. Google Earth: 37 10 19 26 North & 7 31 42 65 West. Beach Towels NOT provided. Strictly NO Parties. Strictly NO Pets. Strictly NO Smoking. The property is well maintained and comfortable for both my wife and I and the family visitors. The owner was very helpful in providing local information and guide to local interests. We would recommend this property to friends and relatives.. The unit wa s clean and well appointed and we loved the location, close to Spain, and all the local dining spots. A standard holiday let over exagerated as a luxury holiday home. The description as a luxury holiday home was not as we found the property. Little in the way of homeliness, rugs, pictures etc. The lack of rugs made the property echo throughout. Various defects were reported to the stand in contact, non of which were rectified during our stay. The intermittent sound on the TV was the most annoying, as we were not able to avail ourselves of the DVD collection. The shower head holder in the bathroom was also problematic. Reported to the contact at the end of the holiday were the two cockroaches seen inside the villa, only able to kill one of them. A major safety item is the lack of a stair gate. A cot and highchair are provided and considering the floors are all hard flooring, a stair gate is therefore an essential. The general cleanliness was disappointing. One bathroom bin was found to contain used sanitary products in it. Veranda's and beneath beds, couches not swept. Outside shower used as storage and looked a tip. Hopefully you will be able to use this feedback to bring your villa back to the standard implied in the correspondence prior to our visit. We are experienced villa renters in various countries and this was the poorest we have experienced regarding cleanliness, maintenance and homeliness. Ian & family, I'm sorry to read that my holiday home didn't meet your expectations. I am in the process of investigating your concerns regarding the TV sound, shower head, cleaniness etc with my housekeeper. In the meantime, my holiday home may be a standard holiday let to you but it is a luxury holiday home to me, my family, friends and to many previous guests, some of whom have written reviews. Rugs & pictures are a personal thing, the reason why I don't have rugs on a tiled floor is for health & safety reasons for the safety of my guests and not merely for aesthetic reasons. And when I find more pictures that are both tasteful & relevant to the surroundings I will purchase extra pictures for the walls. As you say, a baby cot & highchair is supplied, at no extra cost, and I understand your view regarding stair gates but a safety gate is no substitute for hands on childcare, however I advised you, as I do to all my guests with baby(s), details of where one can hire additional baby equipment only two minutes from Faro airport if one feels the need. Thank you for your time in writing a review. All the best, Graham. The beach was great, the "bolinhas" (donuts) became a daily staple. Any crowds on the beach thinned out at around midday and by heading west (easiest to walk right aling the shoreline) for about a mile quiter spots were plentiful. The house was well equipped (a refreshing delight to have sufficiennt cutlery and crockery not to have run a dishwasher mostly empty!) although there was only one chopping/bread board and the non-stick pans had clearly some missuse! The complex was quiet, clean and well maintained, especially the pool and pool area. Although August, most of the various time day we had the pool to ourselves. A welcome pack (which we have had in other similar accomdation) would have been extremely welcome especially as we arrived at around 5 pm on a Saturday, and a snack woukd have been a perfect start to a fantastic stay. All in all, we can thoroughly recommend . Simply superb ! Exceeded all expectations ! A fabulous property maintained and equipped to a very high standard. Manta Rota is a quiet village but has an eclectic mix of places to eat and enjoy coffee or drinks. The owner Graham provided great insight into the area prior to our visit which was extremely useful. The beaches are fantastic and there is a lot of history to be discovered. Nearby larger towns and within striking distance for which we used the recommended local taxi driver Nuno, again his local knowledge was most welcome. The townhouse is equipped with everything one could wish for and has three sun terraces which we loved. Kate the keyholder was always on hand in case of any difficulties and was extremely helpful. All in all, a fantastic holiday and a property that I would highly recommend. Thankyou, Graham, Kate and Nuno. Nice holiday stay and the villa very clean and comfortable. We very much enjoyed our stay and Manta Rota is lovely. We were 3 adults and a teenager. The villa has a shared pool and we visited in September 2016 so it wasn t busy. 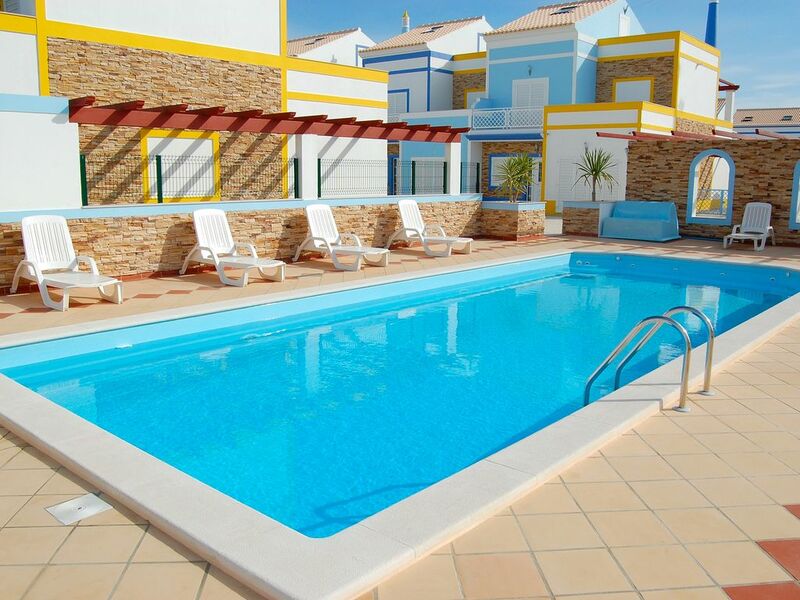 if you had Summer holidays with children in July/August the pool could possibly be busy as there are other properties there too which share it. Everywhere very clean and well maintained and weather was great and hot. The air conditioning is exceptionally good. We hired a car and it was very useful for shopping and visiting beaches around the area. Graham was great and helpful and the instructions for arrival clear. I would recommend the property and the area to anyone wanting a villa break. Jackie & family - Thank you very much for your kind review. It's good to read that you enjoyed your stay at my lovely holiday home, noting that it is very clean, well maintained & the air-conditioning being exceptionally good. Thank you again for recommending my gorgeous holiday home to others and I look forward to having you stay again at my beautiful holiday home. And yes, I agree, Manta Rota is lovely. A popular seaside resort, Manta Rota boasts the largest, longest and reputedly the best beach in the Algarve. This family orientated resort enjoys a gentle pace of life, its laid-back atmosphere makes it perfect for spending peaceful days in the sunshine. Mostly and quietly residential, Manta Rota offers charming restaurants, quiet bars, cafes, snack bars, shops, supermarket, butchers and of course, is also close to a variety of fabulous golf courses. From our fabulous holiday home, one can take a 10 minute 800 metre easy stroll to the uncrowded, seemingly endless sea front and amazing award winning Manta Rota Blue Flag beach situated in an unspoilt dune protected area. Whilst on the beach, you can take a leisurely stroll to Monte Gordo's beach (5 miles / 8 km) east and / or (when the tide is out) Cabanas de Tavira's beach (5 miles / 8 km) west. Between my holiday home and the fabulous award winning Manta Rota beach is a supermarket, butchers, shops, restaurants, quiet bars, cafes and snack bars. The supermarket opens every morning at 8am / 0800hrs and closes at 8pm / 2000hrs and caters for most peoples everyday needs. Neighbouring Villages include Vila Nova de Cacela which is the next town inland from Manta Rota situated about also situated about 800 metres inland from our lovely holiday home. Vila Nova de Cacela has free pubilc access to computers at the Internet cafe and the town has its own market on the 3rd Sunday of every month, get there early as it gets very busy! If you are looking for culture, the elegant historic town of 'Algarvan Rome' Tavira (9 miles / 14 km) being authentically Portuguese, sits on two hills connected by a seven-arched 'Roman' (actually Moorish) bridge over the the River Gilao boasting many fine 18th century buildings along with its 37 churches. also the elegant 18th century city of Vila Real de Santo Antonio (6 miles / 10 km) and the medieval city of Ayemonte (Spain 13 miles / 20 km) with their picturesque marinas, extensive pedestrianized shopping and restaurant facilities, both towns are located on the Guadiana River which borders and separates Portugal with Spain. Vila Real de Santo Antonio Sports Centre comprises: 8 lane outdoor stadium & 4 lane indoor athletic tracks, pole vault, long high & triple jump, synthetic and natural grass fields for javelin, discuss, shot put and hammer throwing, sector for handicap throwing, sprint ramps and ditch for obstacles running. Triathlon open waters (river & sea) training, red clay paths. Weight lifting room, fitness gym, cross training area, jacuzzi, sauna. Indoor Sports Hall. Football. Tennis & Padel Centre. 50m & 25m & 20m swimming pools. And of course there's Golf! There are 7 premier golf courses all within a 15 minute drive of Manta Rota.